About two months ago I posted “10 Things You Didn’t Know You Could Recycle But Should” up on the blog (go check it out!). Recently, I sat down with two women that work with Wisconsin’s Department of Natural Resources, Jennifer Semrau, a recycling specialist for Winnebago County, and Samara Hamze, a program specialist for the DNR. The three of us sat and talked for a while and they taught me a lot about recycling and waste management. Jennifer mentioned a word I had never heard before, “wish-cycling”. This is when people toss something into their curbside recycling bin at home hoping it’s recyclable. I have been guilty of this plenty of times, being unsure about an item but tossing it in anyway, “just in case”. She and I talked about how to “recycle right” and she gave me some great tips to share on the blog. Jennifer and I discussed the top mis-recycled items and I thought it would be best to do a series, “Recycle Right” leading up to National Recycling Day (Nov 15th)! There was simply too much information for just one article. Americans create about 70lbs of apparel/textile waste annually. That’s approximately 20 billion pounds of apparel waste that could end up in landfills across the country. Thankfully, there are tons of ways to recycle/repurpose your old clothes, even the rattiest, oldest pair of jeans in the back of your bottom drawer. 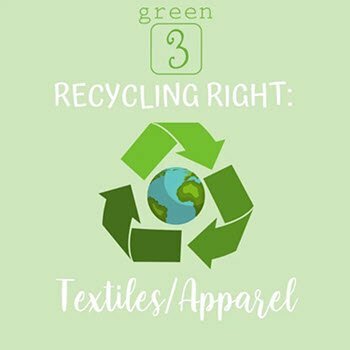 I put together a guide for recycling apparel to make it easier for all of us! Patagonia, Common Threads: Patagonia will buy back your unwanted Patagonia items! Items have to be in working, good condition (no broken zippers, missing buttons, etc.). They will take back their items and give you store credit in return. Crossroads: Crossroads has a few locations across the country and this is a great spot to take clothes that are in great condition and are still in style. They will only take clothes in perfect condition (no stains, no missing buttons, etc.) and you can either get 50% of the price in store credit or 33% in cash. Poshmark and thredUP: These are the easiest options to sell your clothes because you do not have to leave your house! For Poshmark, you have to make an account online and post pictures, captions, and price yourself. For thredUP, you can order one of their clean out kits and send in your unwanted clothes. They will pay you for the ones they want and then will send the rest to charity. Easy peasy! You can donate clothes at Goodwill and Salvation Army, both of which have locations nationwide. The clothes you drop off here should be in decent, wearable condition. You can also call your local homeless shelter to see if they are in need of clothes and help send in what they actually need. H&M, Garment Collecting: H&M has clothing recycling bins at some of their locations! For every bag you drop off, you get a 15% discount card for your next in-store purchase. H&M takes any and all brands in all conditions. They take more than just clothes too! Feel free to drop off old sheets (even if they’re ripped! ), towels, or other textiles around your home. Call your local store ahead of time to make sure they have the recycling bin! Council for Textile Recycling: This is a nonprofit organization that helps people recycle their old clothes. Go to their website to find donation and recycling drop off sites for your textiles nationwide. Hey, wait! What about my shoes? There are a few ways to recycle your shoes! Nike Reuse a Shoe takes back athletic shoes (of any condition!) and recycles them. They take your old athletic shoes and turn them into performance products--whether that is a new running shoe or turf for football fields and tracks. Not every Nike retail store has a recycling program, so give your local store a call before you bring in your old shoes. Soles 4 Souls also takes shoes however these shoes get donated to people in need. That being said, the shoes that you send to Soles 4 Souls should be gently worn. Maybe you have a pair of your shoes that you bought and ended up not loving, or they were crazy trendy when you bought them only to have them go out of style immediately. Go ahead and send those to Soles 4 Souls, they’re happy to donate them for you! Now you’re probably wondering, where is Green 3 on this list? We do not have any kind of in-store recycling/upcycling/donation program set up. This list of companies has inspired us to do so. We are currently brainstorming on how we want to implement a program at our store. Stay tuned to hear what we come up with and how you can participate!